This week’s restoration comes to me from across the Atlantic ~ a P. W. Akkerman Button filler, from the Netherlands. P. W. Akkerman, is (and was) a well respected retailer located in The Hague. They were founded in 1910 and have thrived in the Netherlands ever since. 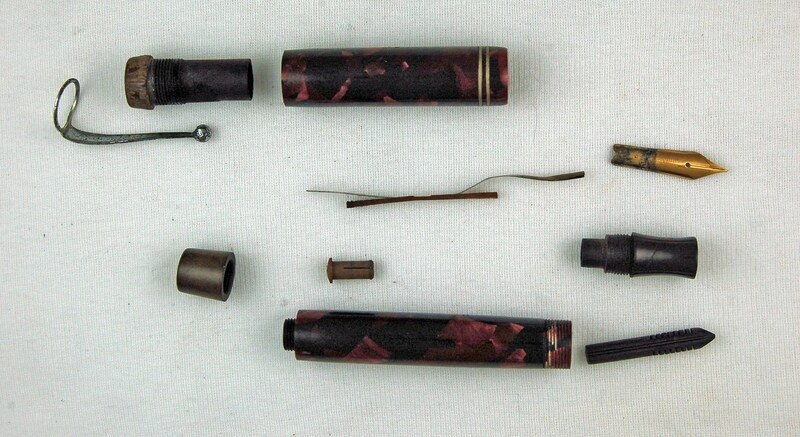 Below is a photograph of the pen after I have taken it apart. You can see that the blind cap and the clip cap are both in very bad condition. This is where the parts bin comes in handy, and I had both available from Duofold Junior donor pens from years gone by. As with most button fill repairs, the pressure bar also needed replacing as this one had lost its rigidity. I used it as a guide to cutting another to the correct size. The nib needed to be cleaned and is the only piece of gold on the pen. The clip and cap bands were at one time gold plated, but that had worn off and all that is left is the steel base. Someone had decided to scratch their name into the barrel and I spent quite a bit of time with find grain paper sanding it off. After this was done, I used scratch remover and polish on the barrel and cap, restoring a bit of their former shine. I fit a size 16 sac to the cleaned nib/feed/section and screwed this back into the barrel with the assistance of a bit of silicon grease. I then carefully placed the new pressure bar in to the barrel through the button hole, making sure it fit securely against the section unit. Remember to smooth down the end of the pressure bar prior to insertion to guard against it shearing the sac. I attached the newly cleaned button to the bar extending from the button hole and tested the mechanism with water. The seals held overnight and the pen fills well. Finally, I inserted the new blind cap and clip cap to the cap and barrel, producing the pen below. Aside from the clip, which is badly discolored and a but pitted, it is a nice looking pen again. The fountain pen measures 4 13/16 inches capped and 5 3/4 posted. 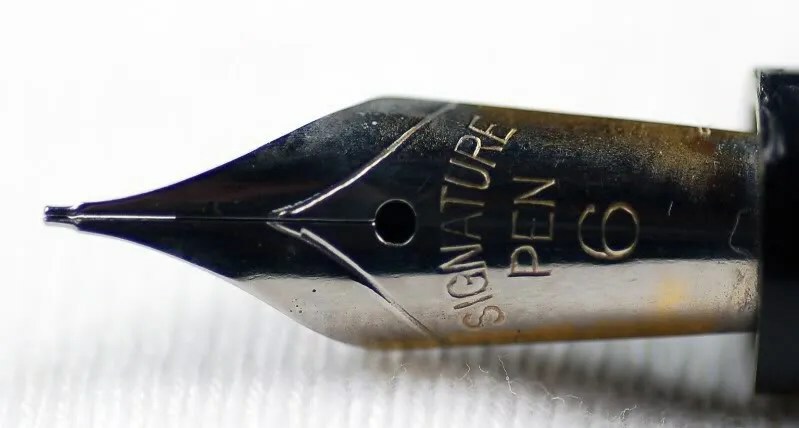 The nib is a Parker arrow nib and is imprinted that is was made in Canada. This is the only marking other than Akkerman on the pen. I do not know if this nib is original to the pen, and suspect that it is not. Below is the imprint, referring to P. W. Akkerman and its two related locations. I have corresponded with Mr. Paul Rutte (The Hague location) and he was kind to confirm that this was indeed an original Akkerman Pen from the late 30s/40s and was available for sale to the general public and not just a promotional piece. He also mentioned that these pens were produced in Germany, and assembled in The Hague. The excellent book Fountain Pens Of The World by Andreas Lambrou, confirms this as it states that Akkerman Pens were produced for them by Lamy in Germany. 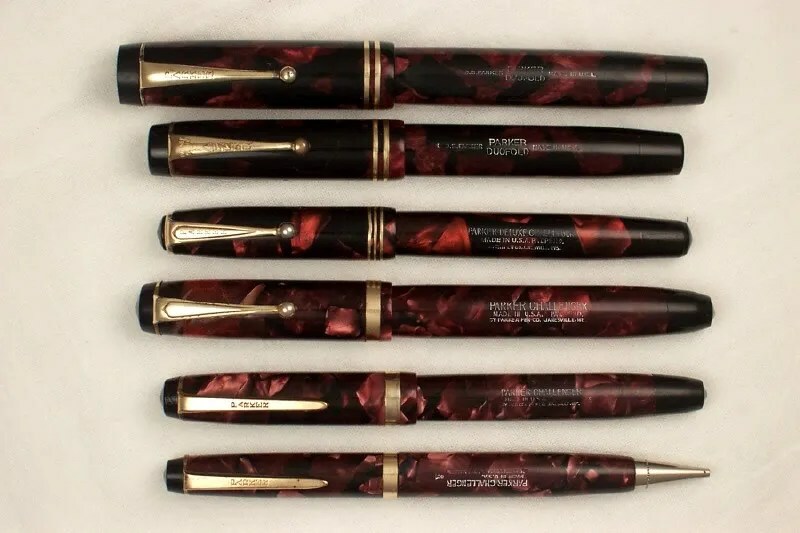 The striking resemblance to a Parker is not so far fetched as the early history of Lamy is tied to Parker, as Josef Lamy actually started with Parker and when he went out on his own, several of his early pens resembled Parker’s (source ~ Fountain Pens of the World, by Andreas Lambrou). 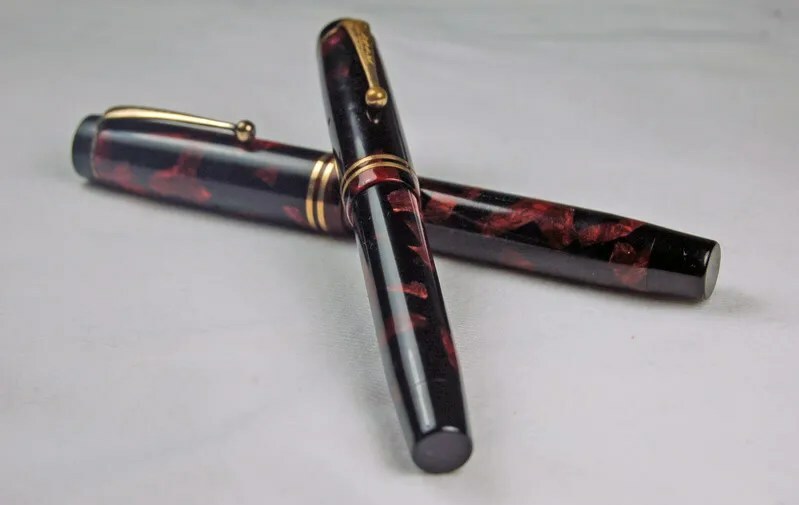 Here is a photo of a Senior and Junior Duofold in the same Burgundy/Black Marbled pattern that were produced in the 30s in Janesville, Wisconsin. The Junior model is almost identical to the Akkerman Pen. Duofold Senior, Duofold Junior, Deluxe Challenger, Challenger, Challenger (small), and Challenger Pencil. In case you hadn’t noticed, I love restoring Vacumatics. They present a challenge, more steps, more chances for mistakes, but the reward is high. The colorful shiny finish and transparency is a nice finish to the project. They can’t all be burgundy double jewels, but some are better than others. Large double-jewels are very nice looking pens and I enjoy the larger size for writing. This weeks restoration is just such a pen. Measuring in at 5 3/8″ capped and 6 1/8 posted it is a substantial pen in the hand. I picked it up for just over $20 and these types of finds are why I don’t buy new pens. As you can see, it came apart to its 13 basic components, not counting the destroyed diaphragm. All parts are in good shape, just a bit dirty. The cleaning was done first, using an ultrasonic cleaner on the metal parts (except for the filler unit). I really like this model as the speedline filler is still metal and the section and cap / barrel ends are all striped to match the golden pearl body. As with previous repairs on vacs that I have covered (see the Categories List on the right of this page under Parker Vacumatic), it is important to clean the inside of the barrel, removing all of the old diaphragm. It likes to hide by attaching itself to the side of the barrel. Be sure to be gentle in removing it so you don’t scar the barrel, reducing its transparency. This size Vacumatic took a Standard Size diaphragm which was attached to the speedline filler and inserted back into the barrel using a vac tool. Always check the barrel by using a gooseneck light (before screwing in the section/feed/nib/breather tube) to make sure the unit and diaphragm are in securely and cleanly. The light should show the diaphragm in a nice clean circle at the end of the barrel and the unit should move cleanly when the filler is depressed. I usually put my tongue over the barrel to feel the vacuum suction a few times. As I have mentioned in previous posts, a good Vacumatic diaphragm lubricant is available at richardspens.com. It aids in getting the diaphragm and filler back into the pen with no bunching. The finished product is below. The pen measures 5 3/8″ closed and 6 1/8 inches posted, though I feel this pen is too large to post comfortably. From the photos below you can see that this is the normal two-tone nib for these pens. The pen dates from 1939. Golden pearl Vacumatics first appeared in 1936 and the streamline fillers began replacing lockdown fillers in 1937. During WWII, these filling units became plastic to conserve metals. The nib on this pen, aside from being two-tone, has a nice generous medium nib, almost bordering on broad. This is always a bonus when searching for vintage Parker Fountain Pens in the wild. Since it is a Holiday Weekend here in the US, I thought I would work on a fun looking pen. Pepsi was invented in New Bern, North Carolina in 1893, and named Pepsi Cola in 1898. I am not much of a Pepsi drinker, but devotees will tell you there is a large difference to Coca Cola. I suspect the Coke devotees would say the same. 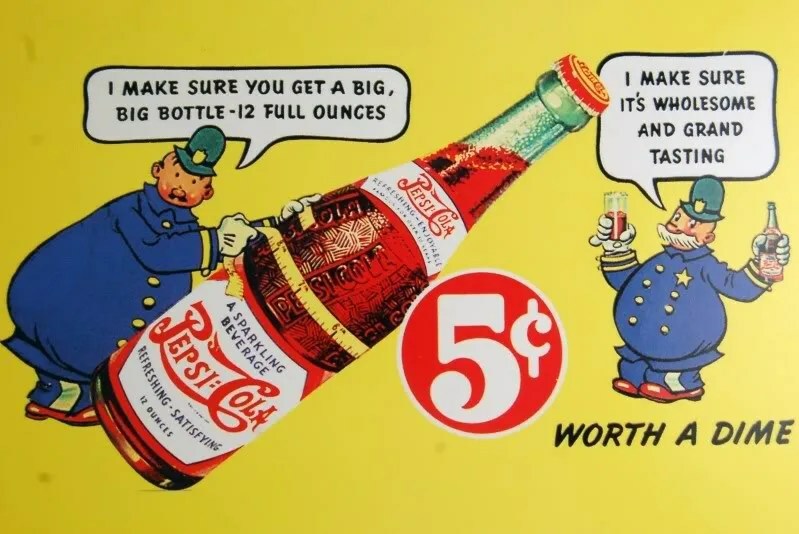 In 1934 the Company began selling 12 ounce bottles of Pepsi for 5 cents, while their competitors were charging the same for 6 ounce bottles. This became a marketing thrust for several years and their sales campaigns and jingles stressed this difference. 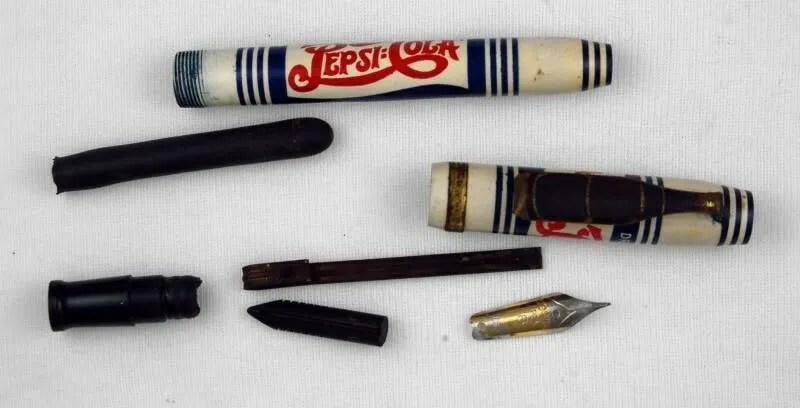 During this time a Pepsi Fountain Pen was manufactured. I do not know who made this pen ~ a few people have speculated it is an Eagle Pen product, but I have no direct evidence of this. You can see that the logo on the pen and advertisement are the same, placing the pen in this same late 1930s period, I would speculate. Below, you can see the exploded view of the lever filler. The size 16 nib has hardened, but had not crumbled. Two things stand out. The clip is a Pepsi bottle that has tarnished. I have seen pristine examples of these where the clip is actually a painted replica of the red, white and blue bottle. This clip has no trace of the colors or logo at all. Secondly, you can see that the nib is gold plate with the typical loss of gold towards the base. The barrel, cap band, threads, and clip all needed work and intensive cleaning (I hate white pens). The j-bar was brittle and needed to be replaced, as did the sac. I spent quite a bit of time cleaning the pen barrel with a cloth and pen polish from Pentiques. I cleaned the threads with Ink-X and a toothbrush. As for the clip and cap band ~ they were cleaned with metal cleaner and a lot of dremel work. The section was scraped, removing any old sac remnants and a new sac was attached using sac cement. The feed was cleaned and the nib just gently cleaned with a jewelers cloth. Here you can see the finished product. The gold band and clip look great. As mentioned above, there is no trace of the original clip artwork which I would prefer to have had, but it certainly looks much better than when I found it (dark black). If you can find one of these with the clip bottle artwork in good condition ~ I envy you. The barrel and threads are also quite clean, though there has been a bit of yellowing over the years that I can not reverse. The pen measures 4 7/8 inches capped and 6 3/16 posted. Here is the Signature Pen No. 6 nib, which is in very good shape, aside from the wear to the gold plate. A close up of the unique clip. And finally, a little Photoshop fun…..